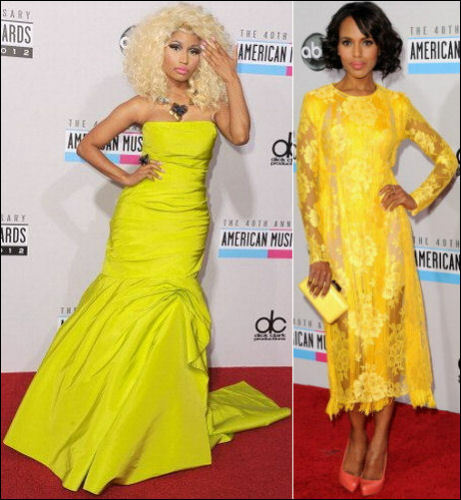 Winner Nicki Minaj wears a yellow-green Monique Lhuillier gown. Kerry Washington in a long-sleeved Stella McCartney dress and Christian Louboutin shoes. Stacy Keibler shows off her long legs in a Collette Dinnigan mini. Kelly Rowland is all smiles in a Naeem Khan dress and Gucci shoes. Jennifer Morrison is pretty in a Abed Mahfouz gown. Lucy Hale in a scoopneck Elizabeth and James dress. Elisha Cuthbert poses in a gold sequin strapless Edition by Georges Chakra gown and a Jimmy Choo clutch. Taylor Swift in a Zuhair Murad creation. Heidi Klum wears an Alexandre Vauthier mini dress and Christian Louboutin shoes. Carrie Underwood walked the red carpet in an Abed Mahfouz gown. Ginnifer Goodwin pairs her Oscar de la Renta dress with Jimmy Choo shoes and a Judith Lieber clutch. Winner Carly Rae Jepsen in a Gomez-Gracia halter dress and Brian Atwood shoes. Pink gets silly in a sleeveless Catherine Deane dress. Jenny McCarthy shows off her toned arms in a Dolce & Gabbana gown.